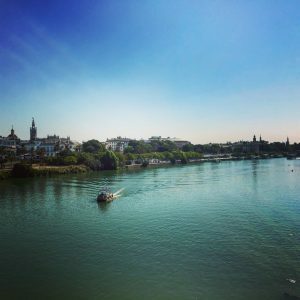 I am the Global Community Manager for a tech startup event called Silicon Drinkabout and at the start of October we held our third annual Summit for organisers from around the world, in the gorgeous city of Seville. A HUGE thanks to the amazing Silicon Drinkabout Seville team who were the perfect hosts providing an amazing work space for our talks, taking us to the best restaurants and showing us the sights of the city. And what a city it is! Whilst northern Italy (where I live) was starting to murmur about winter, we strolled around Seville in shorts and t-shirt in 36° heat. We were staying just West of the river and city centre, so spent lots of time strolling along beside the water and criss-crossing over the beautiful bridges. Seville is a small city and whilst there are busier touristy spots, it immediately felt like a place I could happily make my home. I highly recommend a visit if you haven’t been, especially as you can go out of season and still have great weather. Manuel and I spent a silly amount of money for a year’s membership at our local gym and as such we have been really strict about going three times a week. In order to remind ourselves just how much we paid we created a spreadsheet (happy geeks) with the total cost, and then each time we go we make a record of it, thus reducing the cost per visit. In order to make the price reasonable in my opinion (less than €5 per session) we need to go 120 times in the next year. Doable? I’ll keep you posted! Talking of healthy habits, I have taken the plunge and come off the pill. Earlier this year I heard the founder of Natural Cycles talk at TOA Berlin (read about that here) and it got me thinking about the years I had spent putting hormones into my body on a daily basis; it was time to explore other options. Natural Cycles sends you a fancy thermometer and you take your temperature at the same time every morning before you get out of bed. You record this temperature as well as other information, such as whether or not you have your period, on the app and it tells you whether you are fertile or not. I’ve just about completed one month and am fascinated to learn more about what my body gets up to whilst I’m getting on with life. I have a graph showing me how my temperature changes over the course of my cycle and with these temperatures Natural Cycle was able to pin point the day I ovulated. In this first month my fertile days have hugely outnumbered my non-fertile ones which has been a little frustrating (not just for me 😉 ) but I’m told this is because the app is reliably cautious at the start and will fine tune as I enter more data. Since coming off the pill I have started feeling happier and more fun, closer to my real self. Sure, I think I’m still adjusting and there have been a few hormonal rollercoaster days – like when I got inexplicably upset because I messed up making eggs for breakfast – but I feel happier knowing I’m not using artificial hormones. Using nothing but technology as a means of birth control is certainly a little daunting but if you’re considering it, Natural Cycles is definitely something I would recommend. And finally… the thing I am most excited to tell you about! In September I visited La Salle, a gorgeous crumbling chateau in France, and I came away inspired to run amazing experiences in amazing places. This month I had the privilege of visiting Podere San Giorgio in the stunning Tuscan countryside which absolutely, 100% fits the bill. On route we stopped in Florence which is a beautiful city, although slightly overrun with tourists. As we only had 24 hours we didn’t go inside to see things but spent our time walking around, taking everything in – this is my favourite way to spend the first day in a new place. I will definitely go back as I would like to see the real David (we saw a pretty convincing replica) and explore the Uffizi Gallery. 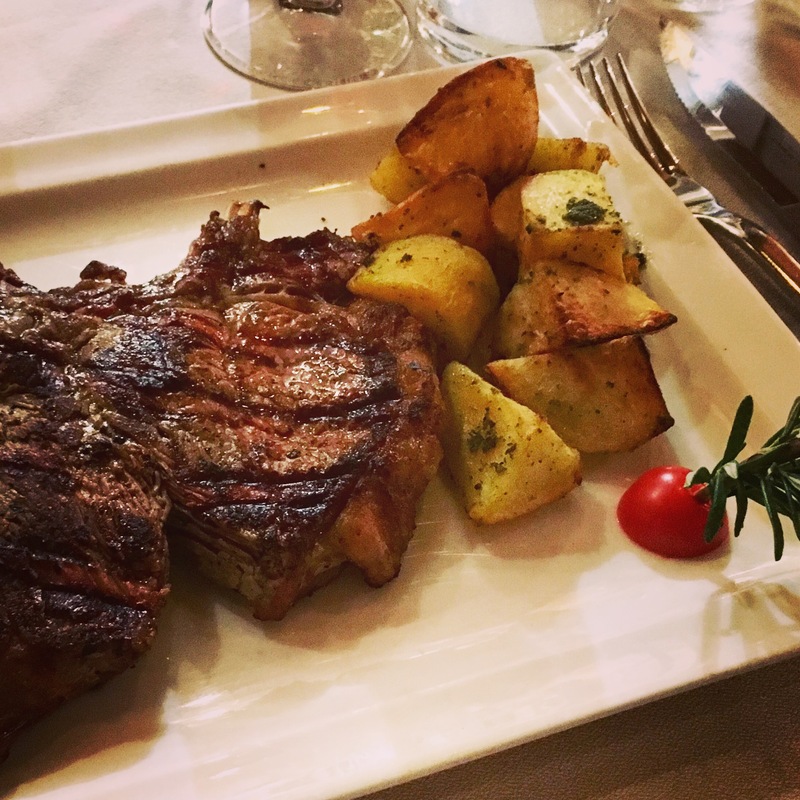 I also missed out trying the famous steak florentine (but had the ribeye instead) because it was so damn expensive. Next time I’ll do a little more research and find the perfect hideaway, frequented by the locals. I fell in love with Podere San Giorgio the moment we arrived. The sun was out and everything looked so green! The sky was so perfectly blue, not a cloud in sight, and the hills rolled on into the luscious distance. The villa there is made up of three large apartments with another two in the converted barn. We explored the olive groves and returned indoors to dip fresh bread into fresh olive oil, pressed only a few days earlier. We walked in to the local village and indulged in both rich coffee and silky ice cream. We slept in comfort and rose the next morning excited to throw open the traditional shutters and take in a new day. 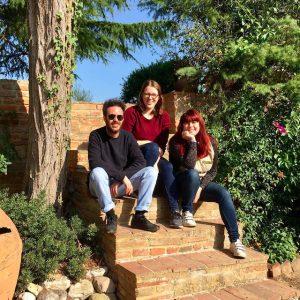 Together with my new business partners Claudia and Andrea, I spent the day working on our plans to enable more remote workers to enjoy Podere San Giorgio. After scrutinising our vision, ethos, budgets, local activity producers, dates and seasonality, starting with the Why? and finishing with the amazing food available to any guest, we had produced Mi Podere, a one week experience focused on balance and sharing. 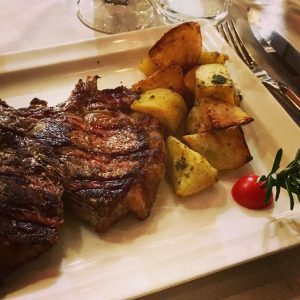 If you are 25-40, work remotely or want to take some time to work on a side project and love the idea of the rolling Tuscan countryside and spending time with like minded people, check it out. That’s all for now folks. If you like what I babble on about then please do follow me on Instagram (travel / food) and Twitter, and if you would like me to write something for you or your company please get in touch.